Measurements are of main unit only. 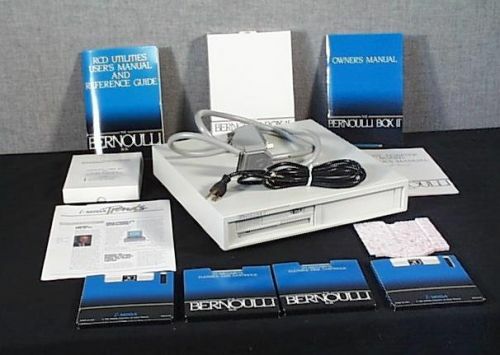 Object consists of Bernoulli box, power cable, connector cable, 3 5-1/4" 20-Megabyte floppy disks, cleaning care kit (cleaning cartridge, head cleaner solution, and 2 pad arm assemblies), and adapter kit (registration card, support notice, empty envelope for backup program, printed circuit board in anti-static envelope, 2 5-1/4" floppies with utilities and backup software, 2 3-1/2" floppies with utilities and backup software), foam and outer box. Software and text given to appropriate departments.